Noise cancelling headphones are great, specially for the people who commute a lot. 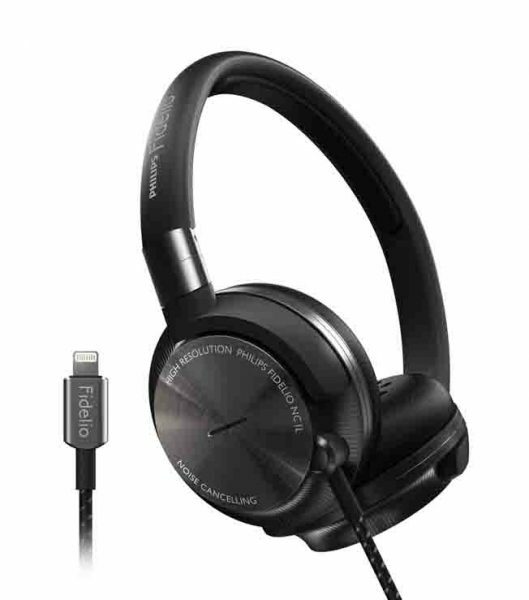 However, active noise cancellation brings the little problem of requiring battery power every time you use them, and having to keep spares, etc. Philips seem to have the answer for us, even though as of now it is only designed for devices with Apple’s Lightning connector. The device takes power from your iPhone, and brings 24 bit Digital to Analog Conversion, amplification and active noise cancellation. The principle behind Active Noise Cancellation is as follows: Four microphones detect ambient noise, invert the signal and effectively cancel it out for the listener. Two ‘FeedBackward’ microphones positioned next to the headphone drivers provide strong noise cancellation at low frequencies, while the two FeedForward microphones positioned on the outside of the headphone extend the bandwidth of noise cancellation into the mid and high frequenciees. On top of that, you have audiophile-grade components, high bandwidth and high precision neodymium drivers, a compact fully foldable and lightweight design, with memory foam ear pads to give you supreme comfort and breathability. The Philips Fidelio NC1L headphones will first be available in Western Europe this Spring with a suggested retail price of €299.